Is trade war still on hold? The latest trade headlines are far from reassuring, and risk certainly remains elevated; though our base case remains that the negotiations will lead to an outcome that is not materially damaging to U.S. or global economic growth. The latest developments include: 1) China’s threat to rescind previous pledges if the U.S. goes ahead with its planned metal tariffs, as Wilbur Ross meets with Chinese trade officials in Beijing that have not borne apparent fruit as of yet, and 2) warnings of retaliation from the EU and Canada ahead of G-7 meetings this week, which Bloomberg characterized as G-6 plus the U.S., highlighting the anti-tariff sentiment among key U.S. trading partners. Are European stocks attractive post Italy “crisis”? With last week’s news that Italy has formed a government, securing the country’s place in the Eurozone, for now, in this week’s Weekly Market Commentary we discuss whether European stocks are now attractive. Relative to other opportunities, namely the U.S. and emerging market equities, we aren’t so sure. Political risk in Italy has dominated the headlines but European economic data has disappointed all year, earnings have softened, and European stock indexes have underperformed their U.S. counterparts meaningfully this year as they have over the past several years. Despite these headwinds, we would not characterize European stock indexes as cheap. On closer look, still a very solid jobs report. One highlight of the jobs report was growing confirmation of acceleration in jobs growth. The rate of job growth has been slowing since the peak in 2015 but, including the latest report, yearly gains have picked up 29,000 jobs a month on average over the last eight months, leaving it still well off the peak but very strong for this point in the cycle. We’ll discuss the jobs report in more detail, as well as trends in the unemployment rate, wages, tariffs, and the potential impacts they could have on inflation and the Federal Reserve’s rate-hiking campaign in this week’s Weekly Economic Commentary, due out later this afternoon. The week ahead. Economic data releases in the U.S. this week (June 4-8) are relatively light, though durable goods and factory orders, and wholesale inventories will provide insight on the state of the manufacturing industry; Markit Services Purchasing Managers’ Index (PMI) and the ISM Non-Manufacturing Index on the services side. 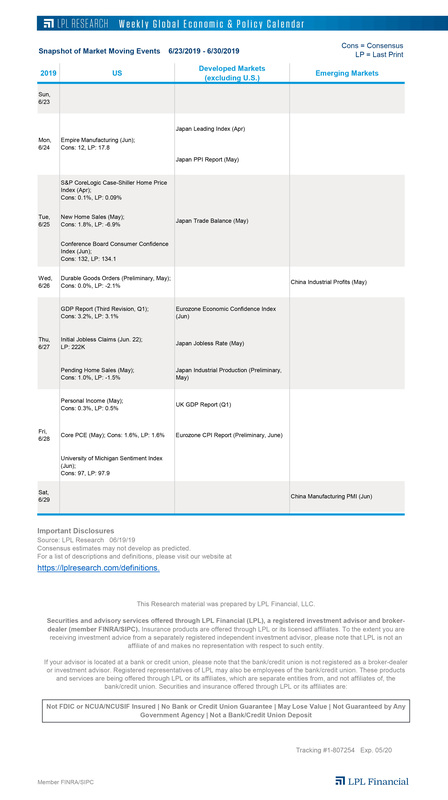 The overseas docket is also highlighted by PMI releases out of the Eurozone, Germany, Japan, and China. Revised (final) first quarter gross domestic product out of the Eurozone and Japan, as well as Chinese consumer and producer inflation will also be on investors’ radars.